While Apple's latest 802.11ac-enabled AirPort Extreme Wi-Fi router isn't scheduled to hit store shelves for at least another day, an unboxing and first test has already been performed in Australia. Introduced on Monday at WWDC 2013, Apple's AirPort Extreme boasts an all-new "mini tower" design, beamforming antennas and support for the super fast 802.11ac protocol. AppleInsider has an exclusive first look at the device thanks to Ben Pasternak of BrandHitTech, who was able to get his hands on one just hours after its debut. Pasternak said the plastic unit is extremely light, though the design is a bit tall and bulky, especially when paired with existing modems on the market. Another downside is the shiny body's predilection to attracting dust. While an 802.11ac-capable test machine was unavailable, a quick trial using common 802.11g/n showed slight gains in throughput possibly attributable to the new AirPort's six-antenna array. The Extreme debuted alongside two AirPort Time Capsule models. Like their predecessors, the latest Time Capsules come in 2TB and 3TB HDD versions. So far, the only Macs to support the 802.11ac protocol are the two new MacBook Airs which were also introduced on stage at WWDC on Monday, but it is expected that Apple will add compatibility as it refreshes its laptop and desktop lineups. Apple probably chose to save some money and, rather than design a smaller case for their new Airport Extreme, they just used the case for the new Time Capsule with the hard drive and connectors pulled out. That means the Airport Extremes (we’re still saying ‘Extremes’, huh?) have a 3.5 inch drive bay empty as confirmed by iFixit in their ritual teardown. That means DIYers can open the enclosure, much like iFixit did, and insert their own drives. The question is: Did Apple put the SATA/Power connectors on the board like the Time Capsules? From the first look, it doesn’t appear that they did. In the worst ‘case’ scenario, DIYers could use the USB port and wire a bus-powered 2.5 inch hard drive (up to 2TB currently) or SSD around inside the case. A quick look on 9to5Toys reveals 1TB USB drives starting at $60 but most people have a USB Flash or HDD laying around. Most of us however will probably pay the extra $100-$200 for an Apple Time Capsule, though if you . 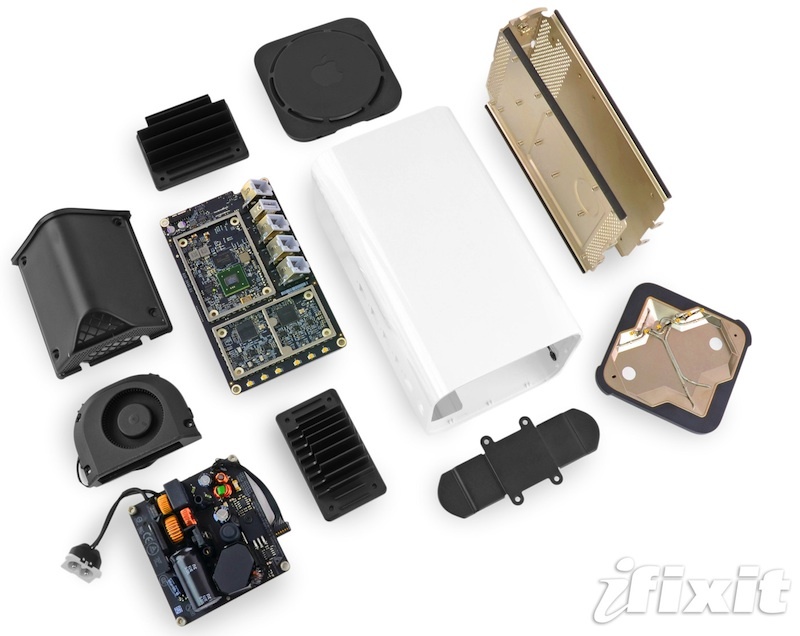 iFixit gave the the AirPort Extreme A1521 Repairability Score: 8 out of 10 (10 is easiest to repair) noting that getting the bottom cover off is a little tricky and there are small parts that can break. Port forwarding Airport Extreme - not getting what I'm expecting?